For the month, Roberto Luongo posted an 8-2-2 record, with a 1.56 goals-against average, a .940 save percentage and four shutouts. Roberto Luongo just couldn’t figure it out. Yes, he felt comfortable. Yes, his confidence was fine. And, yes, it only was October so he definitely was fresh. 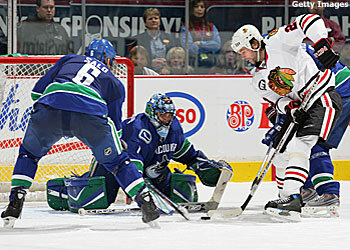 Yet the Vancouver Canucks’ star goalie still was struggling to stop the puck. As if those around the NHL didn’t already know, if you give Luongo time, have some patience with the Montreal native, the wins eventually will start piling up. Luongo turned his cold October into a scorching-hot November. He finished the season’s second month with a bang, becoming the NHL’s First Star of the Week for his play last week, and Second Star of the Month for his play in all 12 appearances in November. For the month, Luongo posted an 8-2-2 record, with a 1.56 goals-against average, a .940 save percentage and four shutouts. He allowed two or few goals in eight of the 12 contests, and surrendered only eight even-strength goals, dropping his GAA from 2.92 at the end of October to its current 2.18. Last week, he was 2-1 with two shutouts, a 0.67 GAA and a .976 save percentage. His franchise-record shutout streak ended at 210:34 when Minnesota Wild forward Eric Belanger scored a power play goal 16:38 into the first period Sunday. The Canucks, meanwhile, enter Wednesday’s game at the United Center in Chicago only two points behind the Wild for first place in the Northwest Division. They were six points behind Minnesota at the end of October. Ironically, the Canucks’ turnaround coincided with injuries to defensemen Sami Salo and Kevin Bieksa, two of Vancouver’s top four defenders. They both had to be taken to the hospital – Salo after taking a puck to the face and Bieksa with a deep gash on his right calf – following a 3-0 loss to Nashville at GM Place, the Canucks’ fourth straight home loss and their sixth in seven games. “That was rock bottom for us,” Luongo said. But it also presented opportunities for a pair of rookies, 21-year-old Alexander Edler and 20-year-old Luc Bourdon. The duo subbed in and was a combined plus-13 with eight points in November. Salo has since returned, shelving Bourdon for the time being. But Bieksa still is out, so Edler still is playing more than 17 minutes per game. Vancouver backed up its hot goalie and young defense by turning up the offense. The key was forming the “Swedish Connection” line Nov. 3. Ever since Markus Naslund and twins Henrik and Daniel Sedin have gotten together, they’ve combined for 14 goals and 30 assists, or more than three points per game. They were a collective plus-26, with Henrik leading at plus-10, in November. As a result the Canucks outscored the opposition, 36-21, in 13 November games, including 20-7 at GM Place, where they went 6-1-1. Naslund had seven goals, Ryan Kesler had five, and Daniel Sedin had four. Henrik Sedin dished out 14 helpers.